Today marks the celebration of a very special cocktail, the Pisco Sour. This cocktail features a smooth brandy liquor produced in Peru & Chile, by the name of Pisco. With crisp notes of grape and citrus, the liquor mixes nicely with the sour of the lime juice and the sweetness of the simple syrup. Think: white south American Brandy. As it is made from different grape varieties, different Pisco will have different characteristics, the three types are: Puro, Acholado, and Mosto Verde. The key to a good Pisco Sour is to find that nice balance between sour and sweet, without sacrificing either. Egg white creates a light, frothy crown on top that brings a soft, creaminess to the cocktail. For those of our vegan friends and others who find the idea of raw eggs in their drinks a bit unappetizing, there are egg white alternatives out there for you! Try out gum syrup or the Happy Hour City favorite, aquafaba. What is aquafaba you ask? Its chickpea brine that acts as a foaming agent and emulsifier, that produces the desired froth. Up until the last 5 years, it was widely believed and accepted that Pisco Sour was invented by a man from Salt Lake City, Utah named Victor Morris. Morris made his way and immigrated to Lima, Peru in 1903. He worked for a railroad company as a cashier and legend has it that when the line from Oroyo was built he was working the inauguration party behind the bar. He was tasked with making Whiskey Sours for some 5,000 people in attendance. At one point, he ran out of whiskey and replaced it Pisco. On April 1st, 1916, Morris opened his very own sophisticated bar, rightfully named, “Morris’ Bar.” It was an immediate success, and his Pisco Sours took center stage. Morris’ was known for hosting high-end clientele like presidents and millionaires from around the world. Unfortunately, some of the bartenders that were taught the trick of a Pisco Sour, left and took this recipe to the competition. After 12 years of running his bar, Victor declared bankruptcy and the Morris’ bar doors shut for good in 1929. Victor Morris died at the age of 56 due to cirrhosis and his wife Maria Varga, along with their three children, moved to San Francisco, California. However, a fight between Peru and Chile broke out, questioning the origin and making claims to the classic cocktail and its high-alcohol base. This might be a valid argument if it wasn’t for a cookbook, Nuevo Manual de Cocina a la Criolla. The publishing date on the front says Lima, Peru 1903. In it, the book only describes how to make Cocktail. The ingredients, the process, it is all too similar to the Pisco Sour to not be the Pisco Sour. The man to give credit to for this great find is activist Franco Cabachi from Pitahaya Bar in Lima, who tweeted the proof. Peru was recently recognized by the European Commission as being the true birthplace of Pisco, this was a triumph for Peruvians everywhere. So, now the world celebrates Pisco Sour Day the first Saturday of February! The Pisco Sour is the national drink of Peru. 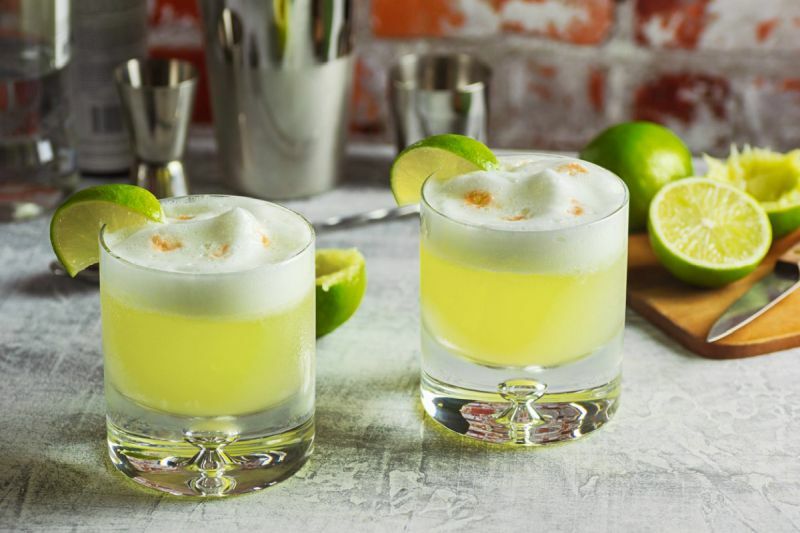 All around, the Pisco Sour is a clean, crisp cocktail that is great to sip on. Give it a try and let us at Happy Hour City know how you like it. Do you use egg whites or do you dare try the deliciousness of aquafaba?